This was a nifty little run with my cobber Brian Howard from the Citypaper again. It used to be that street postering had to have as an element of what Jack London called ‘night-time as an essential condition.’ For many years now I have worked in New Zealand on bringing street postering into the daylight. Street postering is an extremely important form of communication for the arts. It is oftentimes a raw and extremely quick form of communication but usually manages to maintain a very ‘real’ and ‘authentic’ feeling at the same time. I am keen to keep it that way too. Cities need every last bit of that which is real that they can get. This area of Philadelphia reminds me in some ways of the Sydenham area in Christchurch, but it is less tidy. There are the old brick warehouses which are few and far between in Christchurch now as manufacturing shifts further offshore and the shopping malls set in. 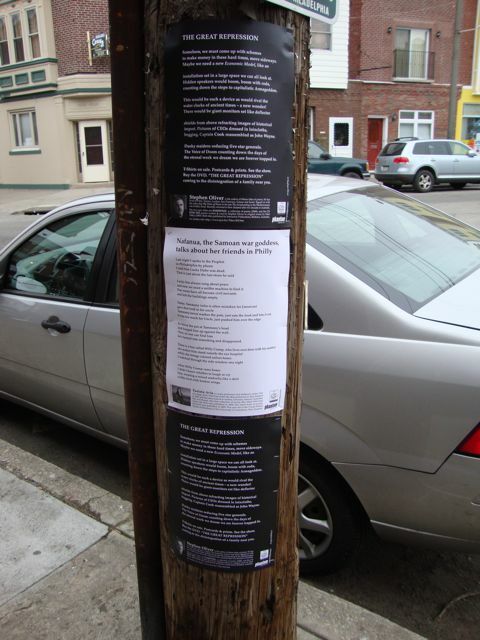 We were carrying poem posters by Janet Frame, Brian Turner and new ones by Stephen Oliver (“The Great Repression”) and Tusiata Avia (“Nafanua, the Samoan war goddess, talks about her friend in Philly”). We have a new launch of poem posters coming up in Auckland, New Zealand at the end of April. Also we have small events in Seattle, Washington and Lambertville, New Jersey in late March and April. Stephen Oliver’s fine poem “The Great Repression” is included in this next launch and we are test marketing it here in the USA. Next week I am away to Mississippi to poster and I shall have under my wing poems by Tusiata Avia and Stephen Oliver. Stephen Oliver is writing about the disintegration of the family unit. He uses very strong words which I very much like. My own personal theory is that every time a city puts in a shopping mall it is doing great damage to its citizens. Don’t get me on to this subject because it splits in every direction, but I will say that marketing as a concept is severely overrated. Some time ago I asked Tusiata Avia to write me a poem that fitted each individual American city I travelled to. And so she did. Tusiata is another extremely passionate writer. There is a line in this poem where the subject is the notion of ‘peace’. Tusiata says we need a sniffer machine now to find it. Ain’t that the truth? Amen. We are all extremely tired of warfare in its many formats. This was a boomer of a poster run and as I went back home up I-95 to New Jersey, I listened to the ‘new’ Jimi Hendrix album. Even something that Seattle’s favourite son chose not to release during his lifetime, and something that does not really measure up to other Hendrix material, is still far better than most music released (and marketed) these days. That guy turned a Fender upside down. He did things completely different. That is to be cherished.